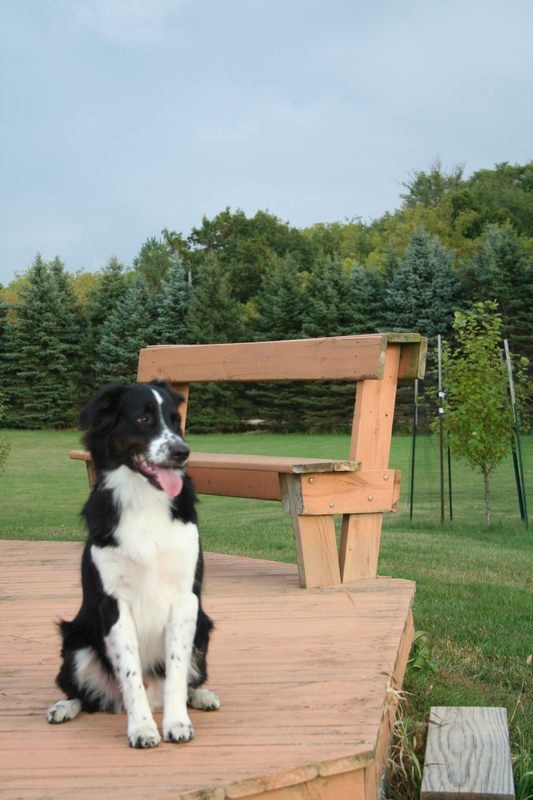 Time to talk about our newest pup, who is also an Australian Shepherd like Piezon. They even sorta look alike, but are definitely two unique characters. This guy came to us with the name Max at the age of three. He is proving to be a smart, loyal and obedient boy. He is the best snuggler I’ve ever had in a pet before. He’s not as much of a worker-bee as some Aussies, but has lots of energy for play. He also has such a fantastic sniffer. His is even better than our last boy’s. There is a golden named Blonde around the corner from us, and Max likes to play with her. He is also pals with our neighbor’s little Jack-Russel-mix, Pepe. He’s already proven to be a wonderful car companion. He has traveled with us more than once to see family 1,200 miles away. 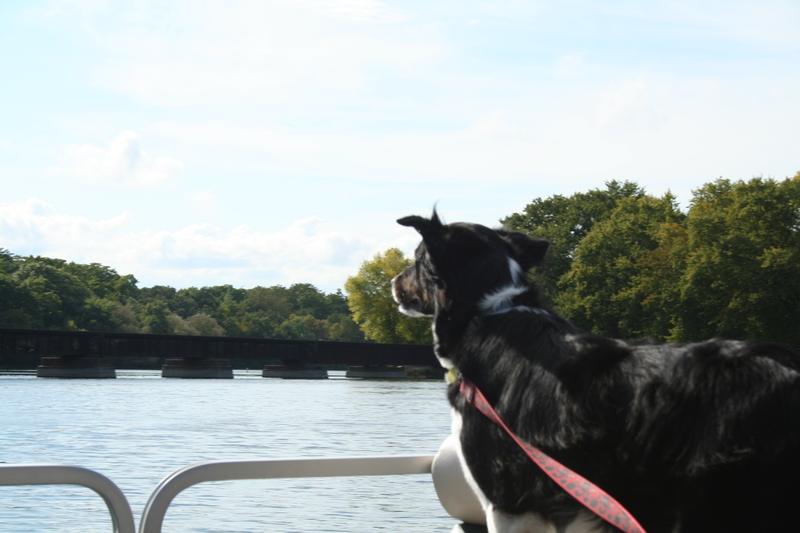 He loved going up to Dad’s house in Wisconsin and enjoyed a boat ride on the river there. He also seemed to want to take care of Mom, who got sick while we were there. Max has been with us for four for years now. We’re so glad he came to live with us and hope we are making him as happy as he is making us. An update on Max’s one year anniversary can be found here. His two year anniversary update can be found here. He’s come such a long way since we first welcomed him home. A beautiful guy – love the photo where he has the wind in his face. Thank you, Mirjam, for stopping by and checking him/us out. Lori, I’m sure you are making him as happy as he is making you! Max is a handsome little fellow. I like the first picture – and Max’s facial expression 🙂 – very much. Thanks for sharing! Congratulations for your new addition to your family. Max looks very handsome and happy. By the way, for some reason dogs know or sense when a person is sick. This is pure observation on my part, but I see a dog be more gentle with a person that is sick than one that is healthy. I think we nickname them because they are like such cartoon characters and need a name that fits their animation. 🙂 My last dog’s nickname “Bubba” sometimes turned into Bubooshka. I even called him Pico de Gallo. Don’t ask me why, it just popped out of my mouth one day. Hello there in sunny Florida! How about sending some of that golden stuff my way? Sounds like you & Max are having lots of fun. Love the photo of him in the boat. It looks like he loves watching where he is going. Our Zip likes to do that too…..but in the car. Love reading about your adventures. I’ll try to send some sunshine your way Joni. 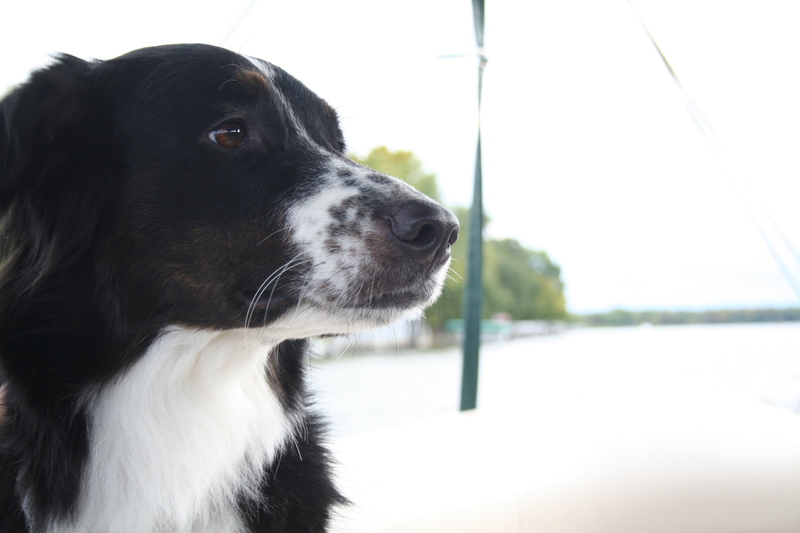 I think in that photo of Max on the boat he’s saying “I’m the king of the world.” Heh, thankfully we didn’t sink. Thanks for stopping by. Give your fur-babies a hug from me. Looks like a great dog with a great home! We have many nicknames for our pet-kids too. One of our babies is a good looking German Shepherd, named Keyser (sounds like Kaiser but think Keyser Soze from The Usual Suspects – it’s Hungarian). We call him Handsome, Mister Man, and sometimes my hubby calls him Megahead. Daisy is a black and white Sheltie. We call her Daisy Mae Rutabaga or Daisymaecus. Lilly is our hound mutt and her main nickname is Lillygoat because she will eat anything and is agile. She is also called Sentinal or Warthog-a-roid (because she can sound so scary when she sees “suspicious activity”). And then we have our Sci-Fi fake monster names (you know all those crazy, silly movies the Sci-Fi channel does, like Sharkpus vs MegaGator?) So, we have Keyerpus, Warthog-a-roid, Snarlasoarus.